According to The Sun, Roman Abramovich is ready to hand his next manager a £130 million transfer kitty to rebuild Chelsea. Italy boss Antonio Conte emerged as the new frontrunner this week as the Blues step up their search for a permanent successor to sacked Jose Mourinho. A fresh round of talks with Conte have been planned to try to move a deal closer to completion. The funds provided to the new boss will be used in hope that four new players will be signed, with Everton's John Stones, Bayern Munich's Arturo Vidal and Roma's Radja Nainggolan all being sounded out already. Chelsea technical director Michael Emenalo has been in Italy scouting players and watched Vidal against Juventus on Tuesday. Stones remains a key defensive target despite an acrimonious and failed attempt to land the £40m-rated centre-half last summer. Skipper John Terry is still leaving at the end of this season as there has been no change in his situation, with no contract currently on offer when his ends in June. After the Blues' below par season, Abramovich knows money will need to be spent to get the club back to the top, and their new manager, whoever it is, will be given lots of it. Portuguese outlet Record reports that Benfica have reached a 'gentleman's agreement' with Manchester United for highly-rated central midfielder Renato Sanches. The transfer fee has not yet been revealed, but Benfica president Luis Filipe Vieira wants United to raise their €40 million up-front offer and lower the €20 million in variables. The club is angling for a record-breaking Portuguese transfer deal. Real Madrid had the 18-year-old as a summer target, and Bayern Munich and Juventus were also keeping close tabs on the midfield dynamo's progress. This caused Benfica to raise the player's buy-out clause to a level that makes him the most valuable player in Portugal, from €30M to €45M, also extending his contract until 2021. When the club got wind of the interest from Real Madrid, that figure went up to €80 million. Malaga could sell Ignacio Camacho for as little as £4 million as they continue to battle financial trouble. The Mirror says Liverpool, among other Premier League clubs, have been tracking the former Atletico Madrid midfielder and are interested in signing him this summer. The Spanish club are desperate for cash, just as they were when Arsenal signed Santi Cazorla in 2012, and even though there is an £8 million buy-out, they are likely to compromise toward a lower fee. The 25 year-old has made 148 appearances for Malaga since joining in 2011, and is a former Spain captain at youth level, with his only senior appearance coming against Germany in 2014. 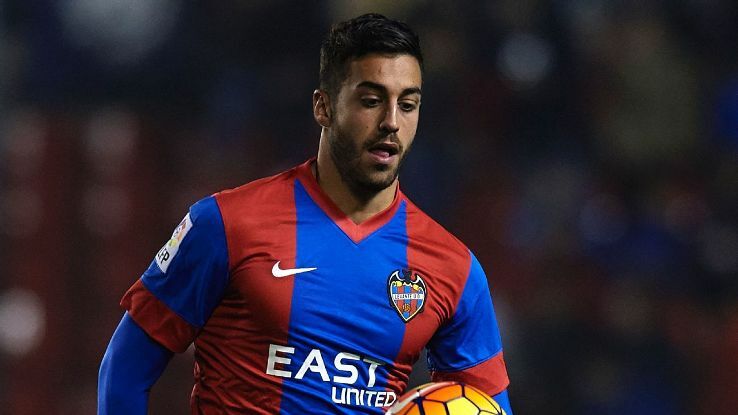 West Ham United have targeted Levante midfielder Victor Camarasa as they begin to prepare for their first season in the Olympic Stadium, report the Independent. The 21-year-old is rated as one of the best young midfielders in La Liga, and has been an integral part of the side who are currently struggling second from bottom in the table. If Levante were to be relegated to the Segunda Division, they will have to sell Camarasa, and West Ham are confident that they could sign him for as little as £3 million this summer. Stoke City were thought to be interested in him during last month's transfer window, before settling for the higher-profile Gianelli Imbula of Porto instead, while Newcastle United were also keen. - Radamel Falcao may be given an opportunity to redeem himself at Europe's highest level next season at his parent club Monaco, says the Evening Standard. The 30-year-old, signed by the Ligue 1 side in 2013 for a fee believed to be £51 million, has spent the past two seasons on loan at Manchester United and Chelsea. - The Birmingham Mail reckons Hull City head the list of likely suitors for out-of-favour West Brom striker Rickie Lambert if the 34-year-old leaves the Hawthorns in the summer. - The Philadelphia Union have announced the signing of Brazilian midfielder Ilsinho on a two-year deal. The 30 year-old has been without a club since June, when he wrapped his second three-year stint with Ukrainian club Shakhtar Donetsk.